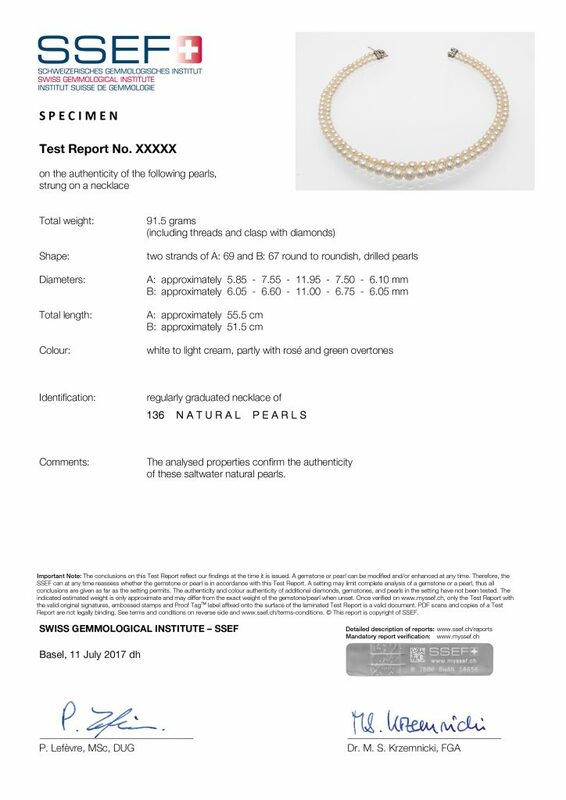 SSEF offers test reports for single or multiple loose pearls, pearls mounted in jewellery and pearl necklaces. A distinction is made between natural and cultured pearls (beaded or beadless), saltwater and freshwater. Treatments (e.g. artificial colour modification) are indicated for both types of pearls. The SSEF report number is the number given to the item when it is submitted for testing, and is a unique number. If an item is resubmitted later for a ‚recheck‘ after re-cutting or for a report update then the item obtains a new report number. The photo of a pearl (lot/necklace) depicts the item at the time of testing. The photo on an SSEF report is for representational purposes and does not necessarily represent actual colour, clarity or size. For size comparison purposes, approx. magnification used is provided under the photo on the report. While the weight of natural pearls is given in carat as well as in grains (1 grain = 0.25 ct), the weight of cultured pearls is given in carat only. For pearl necklaces, the total weight of the necklace is given (including thread and clasp) in grams. This describes the shape of an examined pearl (round, button, oval etc.). For loose pearl lots or pearls strung on a necklace, a range of shapes may be stated, if the shapes vary. If the shape of a pearl has been worked, it is mentioned in this section of the SSEF report. For loose pearls measurements are given of the pearls along different guidelines depending on the shape of a pearl. For strung pearls, diameters are given. For regularly graduated necklaces, this generally includes the two smallest pearls (often nearest to each side of the clasp), two intermediary pearls and the largest pearl. If the necklace has several strands, diameters will be given for each strand (strand A commonly the longest outermost strand). On non-graduated pearl necklaces (e.g. all pearls approx. same size), five diameters are also given on a report. This describes the length of each strand on a strung pearl necklace (including the clasp), and is measured approximately to the nearest 0.5 cm. The colour of a pearl is described first with its body colour (e.g. cream) and optionally the intensity of that colour (e.g. light cream) or a modifier (e.g. brownish). Pearls are greatly appreciated for their orient (overtone colour, e.g. rosé, green etc.) and this is also described on a report if found to be present. The identification of a report will describe the number of pearls (e.g. on a necklace) and if they are natural or cultured pearls. In the case of a necklace, it will also describe if it is a regularly graduated or non-graduated (all pearls approx. same size) necklace. The analysed properties confirm the authenticity of these saltwater natural pearls. Single cultured pearls found in a necklace are commonly described with their exact position, counting from the female part of the clasp, e.g. The analysed properties confirm the authenticity of these saltwater natural pearls and the identity of this beaded saltwater cultured pearl (No. 13 from the clasp). This section would also comment on possible treatments that may affect the colour authenticity of tested pearls.